'saratoga living' has curated our favorite events in the Capital Region on Friday, Saturday and Sunday. What better way to absorb a little local history than with a beer or wine in hand? That’s the goal of the 8th Annual Night at the Brewseum on this Friday, April 12 at the historic Canfield Casino in Saratoga Springs. 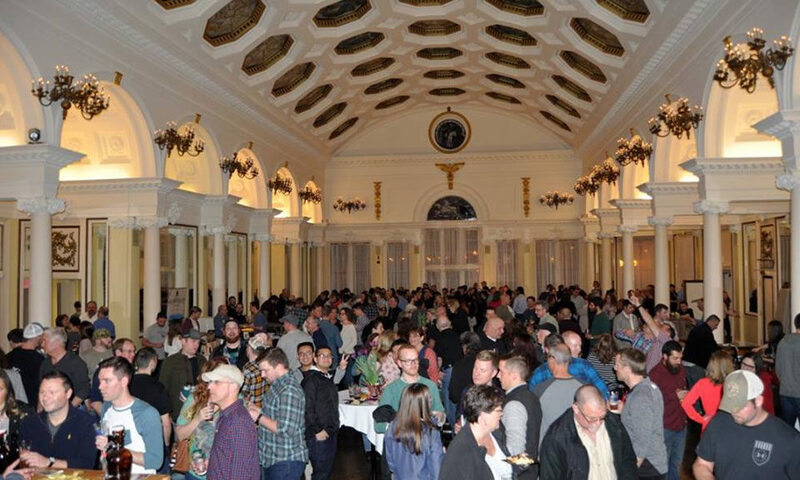 From 6-9:30pm, guests will get to mix the rich history of the Canfield Casino with spirits, ciders, wines and beers from more than 30 vendors representing the best brewers, distillers and winemakers in the Capital Region. Some local favorites will be represented on Friday night including Druthers Brewing Company, Saratoga Winery and Saratoga Apple’s Hard Cider. In addition to all the libations, there’ll be a selection of vendors from local restaurants as well, including Harvey’s Restaurant and Bar and Mama Mia’s Pizza and Cafe. Night at the Brewseum is hosted by the Saratoga Springs Lions Club, a local nonprofit that provides Spa City residents with a range of services, from helping the blind and deaf to funding youth initiatives and community development programs. All proceeds from Night at the Brewseum will go back toward funding the Lions Club’s ongoing mission. Tickets can be purchased online or at the Mama Mia’s bar on Ballston Avenue. Still need more to do? saratoga living has got you covered with a number of other exciting events to enjoy in the area. Adirondack Winery’s 11th Anniversary Extravaganza – April 12-14, a weekend full of special events, great giveaways, a five-course wine dinner and more at Adirondack Winery’s Lake George Tasting Room and Fort William Henry. Roots Music Festival 2019 – 8-11pm at The Linda in Albany. Girl Blue with Olivia Quillio – 7:30pm at the Park Theater in Glens Falls. To read an exclusive interview with Girl Blue, click here. Capital Region Guitar Show 2019 – Friday and Saturday at the Saratoga Springs City Center. Empire State Comic Con – Celebrity guests, comic book artists and exhibitors all weekend at the Albany Capital Center. 2019 Word Fest – The best poetry and spoken word of Upstate New York, kicking off this Friday and running through Saturday, April 20 at various locations throughout Downtown Albany. 8th Annual Gospel Jubilee – 7pm at Proctors Theatre in Schenectady. Harrison Lobdell Gallery: New Works for 2019 – 4-8pm, catch the first exhibition of 2019 for the Harrison Lobdell Gallery in Saratoga. For more about the gallery, click here. Downtown Albany Restaurant Week 2019 – The 15th Annual Downtown Albany Restaurant Week kicks off this Saturday and runs through Friday, April 19 at more than a dozen participating restaurants in the Albany area. 8th Annual Green & White Gala – 6-10pm at the Hilton Garden Inn in Clifton Park. The Fab Faux: “From the Cavern to the Rooftop” – A Beatles tribute concert, 7:30pm at The Egg in Albany. Justin Moore Live in Concert – The country music star will perform at 8pm at the Palace Theatre in Albany. Robyn Hitchcock – Catch the surrealist poet and guitarist-songwriter at 7pm at Caffè Lena in Saratoga. 8th Annual Empty Bowls – Hosted by Wilton Food Pantry, 1-4pm at the Saratoga-Wilton Elks Lodge in Saratoga. ESYO Symphony Orchestra Performing Tchaikovsky’s 4th Symphony – 3pm at the Troy Savings Bank Music Hall. Jeff Dingler is saratoga living's Senior Writer. He's a graduate of Skidmore College and a professional musician.